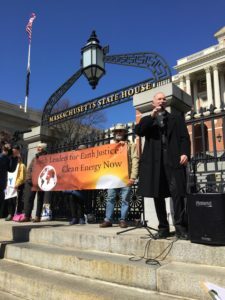 On a bright, wind-swept day shortly before Easter and Passover, a crowd of faith leaders and members of faith communities gathered on the steps of the Massachusetts State House to call upon Governor Baker to take bold leadership in addressing climate disruption. Drawing from the ancient stories of Moses confronting Pharaoh and of Jesus confronting the imperial powers of Rome, “Exodus from Fossil Fuel” celebrated our shared determination, as people of diverse faiths, to set ourselves free from fossil fuels and to create a more just and sustainable society. 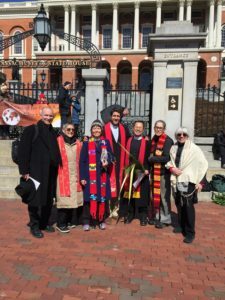 Before we created and carried out this public event, eighteen faith leaders representing a range of religious traditions – including the Commonwealth’s top leaders of the Episcopal Church, United Methodist Church, and United Church of Christ – signed a letter to Governor Baker. In our letter, we expressed our conviction that we have a spiritual and moral obligation to protect the web of life. We appealed to the Governor to meet with a small group of faith leaders, so that we could discuss the values that lead us to oppose construction of all new fossil fuel infrastructure in the Commonwealth. We heard not a word in response. The lively outdoor service included songs and prayers; a moving litany of “climate plagues” and public mourning led by two rabbis; and speakers representing front-line communities from all across the Commonwealth that are resisting new fracked gas pipelines with vigils, protests, and non-violent civil disobedience. 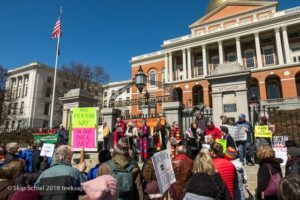 After a closing blessing and song, we walked in procession to the State House, led by the drumbeats and chants of a small group of Buddhist monks. At the doorway to Governor Baker’s office, a few of us spoke with his staff members. Meanwhile the crowd filled the hallway, writing postcards to the Governor, holding palm branches aloft, and singing songs of hope. Then we scattered in every direction, heading to the offices of our state representatives and senators to advocate for the Senate’s clean energy omnibus bill (S. 2302) and the House’s environmental justice act (H. 2913). Astonishing news arrived the next day: the judge in the trial of the final 13 defendants who had carried out civil disobedience to protest the West Roxbury Lateral fracked gas pipeline were found not guilty, reportedly because their actions were deemed a “necessity.” If confirmed, this could be the first time that defendants were acquitted based on “climate necessity.” Since I was one of the 198 people arrested for carrying out civil disobedience at the site of this high-pressure, dangerous pipeline, I feel particular joy in celebrating the judge’s historic decision. The Berkshire Edge wrote a good short article about Exodus from Fossil Fuel that can be found here. The entire worship service (except for improvised statements that have yet to be transcribed) can be found here. We hope you will use this document to stimulate your own thinking about how to create an interfaith worship service that lifts up the urgency of combating climate change. Please let us know what you come up with! We also hope that, in reviewing this service, you will be inspired by the range and depth of active resistance to fracked gas pipelines that is now being carried out across the Commonwealth. Do you wish to express your own commitment? Clergy and religious leaders are invited to sign a statement calling for moral leadership for climate justice. The Clergy Climate Action statement includes a pledge to resist new fossil fuel development through nonviolent direct action. Congregants and community members can also add their support. God of abundance, we stand before you with grateful hearts, thankful for the gift of life, thankful for this beautiful world that you entrusted to our care. Thank you for sending into our midst these warriors and prophets who are giving themselves to the struggle to preserve a habitable world! We ask you to bless them and protect them. Give them courage when they are afraid, strength when they falter, and comfort when they grieve. Sustain them with your bountiful Spirit and guide them on their sacred path. We ask your blessing on every one of us here. Thank you for the love that drew us here today, for the love that wells up from the center of our being, abides in our midst, and reaches out in every direction, calling us to recognize each other and all other beings as kin. Help us to bear witness to that love in everything we say and do. We ask you to bless our Governor, our legislators, our political leaders, and all in authority, to turn their hearts and to guide them to make wise decisions that serve the common good. And we ask you to bless our efforts going forward. Make us bold and humble, fierce and tender in our search for justice, healing, and peace. Amen. Deep thanks to Andrew Mudge of Blackkettle Films, who donated his time and skills to make this inspiring 4-minute video of Exodus from Fossil Fuel, which is now posted on YouTube. Thank you for this report. I’ve eagerly awaited to hear how this went, and was not disappointed! The actions of this interfaith coalition are an inspiration. Thank you for your leadership role in pulling all of this together, and for all you do to protect God’s Creation. Thanks for your encouragement, Leah. It is truly inspiring to stand shoulder to shoulder with people from different faith traditions, all of us united in a shared commitment to honor the sacredness of Earth and her many communities. I am very grateful for your ongoing leadership in the faith-based climate movement. I participated in a Seder meal last week and heard from the beginning the cry for exodus from slavery to fossil fuels. What if in the future there was a ritual by our descendants, remembering how they were saved. What might that look like? What a creative and provocative question — one worth exploring. It is helpful to expand our sense of time beyond the present moment and to consider our relationship with our descendants. Our job is to be good ancestors. Thank you!